Background: Simulation in remote areas it is often a cost-prohibitive proposition and low cost, homemade solutions lack standardization. 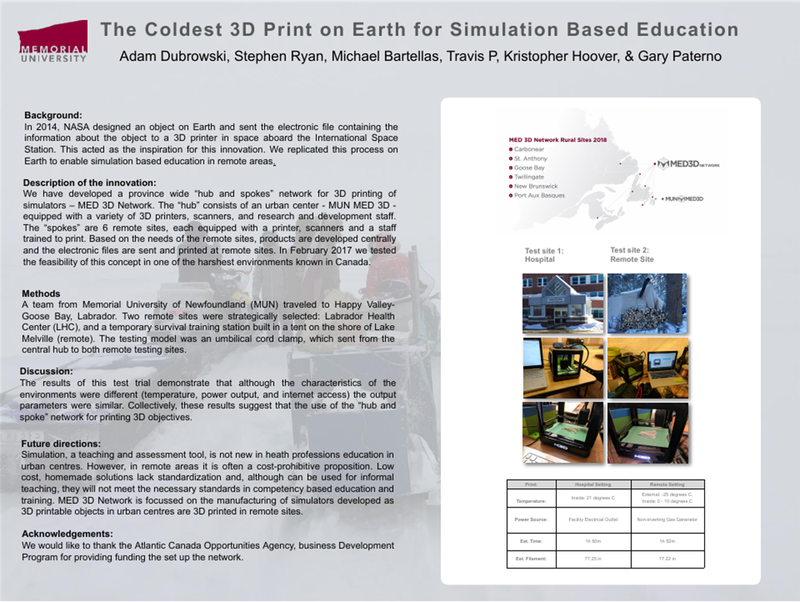 We propose an alternative, where 3 dimensional (3D) printable simulators, developed in urban centres, can be printed out in remote sites using 3D printing. The purpose of this pilot project was to test the feasibility of this approach in 2 remote locations. Description of the innovation: We have developed a province wide “hub and spokes” network for 3D printing of simulators (MED3D Network). In this network, the “hub” consists of an urban center equipped with a variety of 3D printers, scanners, and research and development staff (MUN MED 3D). The “spokes” are remote sites equipped with a printer, a scanner and a staff trained to print. Results of evaluation: Two remote sites were selected for this pilot project: Labrador Health Center (LHC), and a temporary trailing station Lake Melville (remote). The 3D printer and the file of the model (umbilical cord clamp) were identical at both sites. For the LHC and remote sites respectively the following parameters were recorded: the external temperature for both sites was -27 Celsius (C), while the interior temperature was +21 C vs. 5 C; the power sources were standard socket at 110 V vs. non-inverting gas generator; the internet access was through a hospital network vs. 3G-phone connection. The print took 77.26 vs. 77.22 inches of spool, and 95 vs. 120 minutes for LHC and remote sites respectively. Conclusion: These results demonstrate that although some input parameters differed drastically (i.e., temperature, power sources, internet access) the outputs were similar. This suggests that the use of the “hub and spoke” network for printing simulators, and possibly medical devices in remote context are feasible.